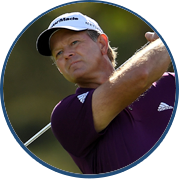 Tenacious and fiercely competitive, Lanny Wadkins has always been supremely confident in his abilities on the golf course. 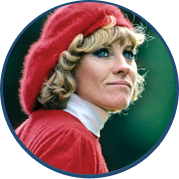 With a quick pace of play, Wadkins won 21 PGA TOUR events including the 1977 PGA Championship. 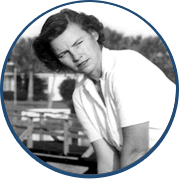 A native of Richmond, Virginia, Wadkins showed marvelous ability as a junior golfer. Attending Wake Forest University on an Arnold Palmer Scholarship, he proved to be one of the finest amateurs of the day. 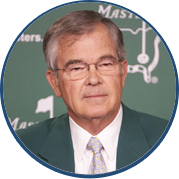 He played on the Walker Cup Teams of 1969 and 1971 and on the World Amateur Team in 1970. In the years that the U.S. 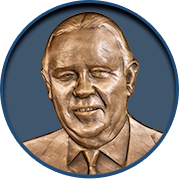 Amateur was played at all stroke play (1965 – 1972), Wadkins set the all-time record of 279 with his win by one over Tom Kite at Waverley Country Club in Portland. It was a portent of great things to come. "It was only the most important shot of my life, Jack. There's nobody I'd rather have hit it for." He joined the PGA TOUR in 1972 winning the Sahara Invitational in Las Vegas and was later voted the 1972 PGA TOUR Rookie of the Year. After two wins in 1973, his game went into a swoon as he did not win again for three years. But in the 1977 PGA Championship at Pebble Beach, Wadkins regained his form. Beginning the final round six shots behind the leader Wadkins made two front nine eagles but was still five shots behind entering the final nine. When the leader bogeyed five of the first six holes on the back side, Jack Nicklaus bogeyed the 17th to fall out of contention. Wadkins proceeded to birdie 18 for his only birdie of the day to force a tie. The first sudden death playoff for a major championship ensued, but with momentum on his side, Wadkins bested Gene Littler by making a six-foot putt on the third playoff hole. Wadkins continued to play at a very high level, especially in the majors, finishing second in the U.S. Open in 1986, second in the PGA Championship in 1982, 1984, and 1987, third in The Masters in 1990, 1991 and 1993 and fourth in The Open Championship at St. Andrews in 1984. He won THE PLAYERS Championship at Sawgrass in 1979, played on World Cup Teams in 1977, 1984 and 1985 and was named PGA TOUR Player of the Year in 1985. But Wadkins is perhaps best known as being one of America’s finest ever Ryder Cup players. 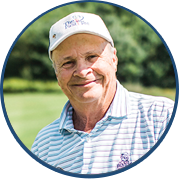 He played on eight Ryder Cup teams, a record he shares with Billy Casper and Raymond Floyd. His overall record of 20-11-3 ranks just below Billy Casper’s all-time record of 20-10-7 and Arnold Palmer’s 22-8-2. Lanny Wadkins won the first-ever sudden-death playoff in major championship history at the 1977 PGA Championship. It is axiomatic that the more Ryder Cup Teams one plays, the more records one has the possibility of setting. So it is with Wadkins. He ranks second in most matches played with 34, third in most points won with 21-1/2, sixth in most singles matches played with eight, tied for first in most foursome matches with 15, tied for third in most four-ball matches with 11, tied for second in most matches won with 20, tied for first in most foursome matches won with nine and tied for first in most four-ball matches won. Clearly, it is one of the strongest ever Ryder Cup records for an American player. Wadkins’ finest moment in the Ryder Cup came in the final round of the 1983 matches at PGA National Golf Club. With the score tied 12-1/2 – 12-1/2, three matches were left on the course. Sam Torrance and Tom Kite worked to a half, as Tom Watson was one-up on Bernard Gallacher on the 16th and Wadkins was one down to Jose Maria Canizaries playing 18. All of the pressure was on Wadkins. Laying up on the par-5 18th hole, Wadkins was about 70 yards from a pin tucked just behind a large bunker. He almost holed his wedge shot, as the ball stopped about a foot from the cup. With a Wadkins birdie to win the hole, the match was halved and the U.S. side earned the crucial 1/2 point. Almost simultaneously, Watson closed out Gallacher on 17. The U.S. had eked out the win over the Europeans by one slim point, 14-1/2 – 13-1/2.